Posted by Carolyn Burns Bass in commercial fiction, fiction, mystery. When murder is wrapped around a feisty protagonist, a cast of zany characters, a love interest, and a vivid setting, laughter ensues and the horror of death is deflected. Carl Hiaasen and Janet Evanovich have turned this list of ingredients into a formula that has elevated them to celebrity status in the minds of mystery readers. A formula this broad allows ample room for new authors to play. This week in LitChat we’ll discuss books that use humor to deflect tragedy. On Friday, March 26, Wendy Clinch, author of Double Black, joins us as guest host of this discussion. 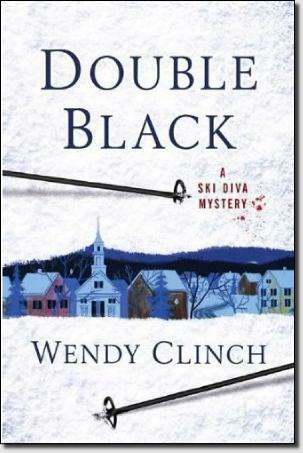 Double Black is Clinch’s first novel, a story set in a picturesque Vermont ski town so real you’d swear you took your first lesson there. A deft casting of straight characters against caricatures deflect the pall of death that hangs over this idyllic setting, picking up speed for a fun run to the finish. While the story never lacks sparkle, it’s the passages when characters are geared-up on the mountain, reflecting Clinch’s passion for skiing, that brings this novel to life. 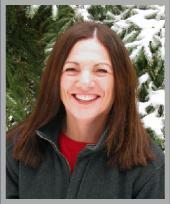 Born and raised in Ocean County, NJ, Wendy Clinch is the founder of TheSkiDiva.com, the premier internet community for women skiers. She writes about women’s skiing and related topics at her blog. Clinch is a former advertising copywriter, having spent more than 25 years in the field, most recently as a partner in her own agency in suburban Philadelphia. A graduate of Syracuse University, Wendy now lives in Vermont with her husband, Jon Clinch, author of Finn: A Novel and the forthcoming Kings of the Earth, both from Random House. Follow Clinch on Twitter at @WendyClinch. Read chatscript from Wendy Clinch’s visit in #litchat here.